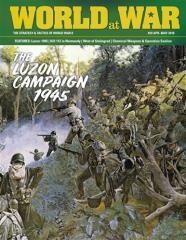 #59 "Luzon, The Tyranny of Terrain, West of Stalingrad"
Product Line: World at War Magazine #51 - #101 - Magazine Only! The Tyranny of Terrain - The fight for Hill 112 in Normandy: Hill 112 was an important strategic landmark in the German defense of Caen. In the weeks that followed the Allied landings on the Normandy coast, British forces conducted a number of operations to seize this vital piece of territory. West of Stalingrad: The Battle of Stalingrad is usually portrayed as a brutal urban fight, but another important battle occurred west of Stalingrad in the weeks prior to the German attack on the city. Opening Pandora's Box - Chemical Weapons & Operation Sealion: Recently declassified intelligence documents from World War II have given much greater detail about German preparations for chemical and biological warfare in Operation Sealion.